I have a new (late 2013) MBP that I use with an external monitor. Annoyingly, when I plug/unplug the monitor, arbitrary spaces end up being fixed to either the internal or external monitor. Going to mission control doesn't appear to let me move spaces from one monitor to another, so I have to manually shuffle around each window. Is there a keyboard shortcut (or something) I'm missing to move spaces between monitors? You can only move spaces which are non-active. For example, lets say you have spaces 1 and 2. If space 1 is active, you can not move it. 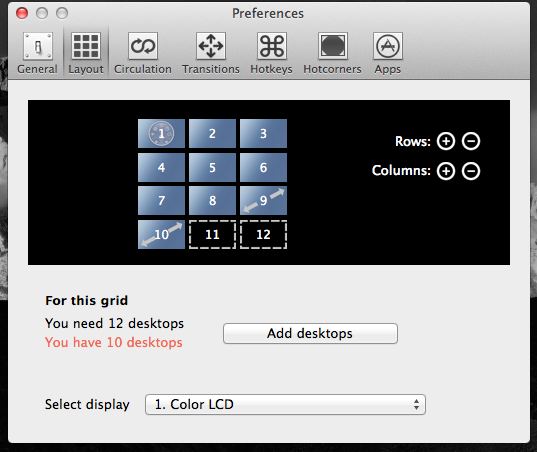 You first have to select space 2 then you can move space 1 to a different monitor. TotalSpaces allows you to assign spaces and their contents to specific monitors. Not the answer you're looking for? Browse other questions tagged mavericks display spaces mission-control .